Canadian native Kinsella’s first novel to be published in the US since Box Socials (1992) is another saga of baseball in Iowa. Ever since the success of Field of Dreams, the film based on his novel Shoeless Joe, Kinsella has been plowing the same furrow of corn-fed, baseball-driven magical realism. This new effort comes after a long layoff resulting from a serious accident that cost him four years of hospitalization and rehabilitation. 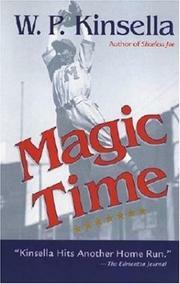 Regrettably, like a player coming off the disabled list, Kinsella seems rusty, his timing more than a little off in this story of Mike Houle, a star college second-baseman at the end of a lousy senior year who is offered one last chance at a baseball career by his agent. His last-ditch effort will put him in the semi-pro Iowa Cornbelt League in the idyllic town of Grand Mound. But it quickly becomes obvious to Mike, who narrates, that Grand Mound is, if anything, too idyllic. The family he stays with treats him like a son, welcomes his widower father with glee, and hooks him up with a pretty widow. Everyone seems too good to be true, and the team never gets beyond playing inter-squad games that attract the entire population of the town. Of course, there’s a deep secret, but, as usual in Kinsella's feel-good fairy tales, the secret is as much in Mike’s heart as in the town itself. Kinsella has been guilty of overwriting, but the purple patches in Shoeless Joe were amply compensated by a certain craftiness in the book’s overall architecture. The prose in this outing, regrettably, is flat and affectless, devoid of texture or sense of place or era, while the interweaving of plot strands is mechanical. The result is a treacly valentine to small-town life in something akin to the Norman Rockwell mode.